Make Your Flying Stork Reservation Today! When We Pick-up the Stork Sign Rental, The Customized Bundle is Left on The Doorstep for Parents as a Keepsake to Cherish for Years. 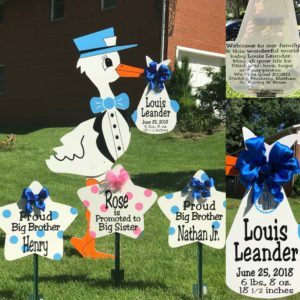 The Cost of our Stork Lawn Sign Birth Announcements is Similar to the Cost of Sending Flowers, But our Storks Are Unique, Exciting and the Memory Lasts forever….. The birth of a baby is an exciting and happy time for all parents, as well as their family and friends. Let us help you celebrate the birth in a Unique way! Our adorable 6 ft storks are the perfect way for families to announce and share the excitement of welcoming their brand new baby. 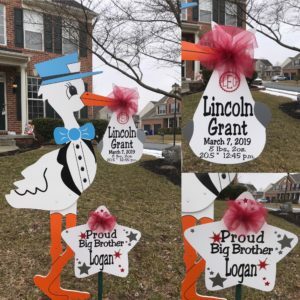 Each one of our (7) day lawn sign stork rentals includes a ‘bundle of joy’ that is customized with all the baby’s delivery information for everyone to see and the parents to keep! 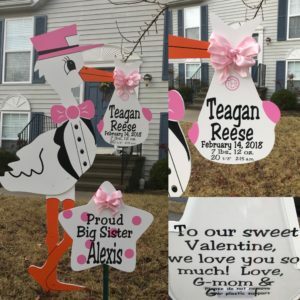 Flying Stork’s love to help make the new baby’s older brothers or sisters feel just as special with their very own sibling sign. Our sibling stars include their name and announce that they are now a proud big brother or sister. 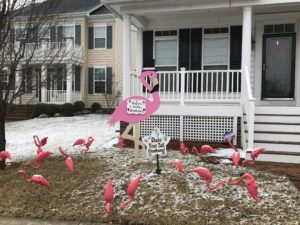 Flying Stork’s are a fun way for Proud grandparents to announce to neighbors and friends the arrival of their beautiful new grandchild with one of our adorable lawn sign storks. Baby showers are an exciting way to celebrate the mommy-to-be and the sweet baby to be. 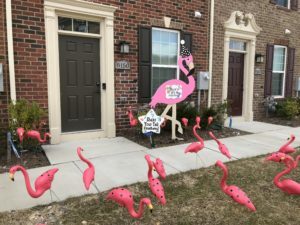 Our beautiful lawn stork sign provides a unique way to greet party guests. The bundles can simply state “Jump for joy, it’s a boy”, or “a giggle, a curl, it’s a sweet baby girl” or can be personalized with the mother’s name to read “Welcome to ____’s baby shower” for an additional fee. Finding out the gender of the baby is incredibly exciting. Why not make it more memorable? Have Flying Storks announce the news in front of all your family and friends!